In Watford, the council is trying to put technology in the bin. It’s not what it sounds like. Having invested in a LoRaWAN network – which can transmit information over a large area using very little power – staff are considering how they could use it to connect to physical objects traditionally regarded as inanimate. Among them: bins. “We’re looking at little bin sensors,” said Andrew Cox, head of service transformation at Watford BC. “So, rather than the standard model of going around and you empty this bin and then you empty that bin because you’re in a round, I want to empty bins when they’re 75% full. It’s a striking example of how digital technology might have the potential to make council services more efficient, more effective, and more directly targeted to the citizen. But what needs to happen if all manner of digital technology is to be truly embraced by local authorities up and down the country? 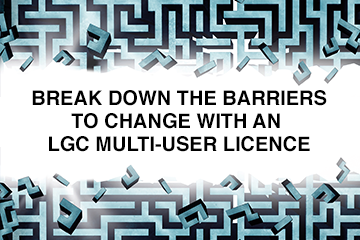 It was a question that LGC put to a panel of experts at a roundtable debate in June. Held in association with Capita On e, the event brought together senior figures to consider the opportunities and challenges presented by greater digitisation. Mr Cox argued that for a digital approach to truly flourish in a local authority, it will be key to see it as integral to a council’s work. He explained that Watford BC is committed to exploring “how we can use the opportunities from digital technology to enable the transformation of the organisation.”. But he stressed that it was being considered in the round. “We’re working through a programme of transformation, but we’re deliberately not writing a digital strategy. Because I don’t think that’s the right answer. I think the answer is a business strategy enabled by digital, and that’s absolutely how we’re focusing. As business development director at Capita One, Chris Singleton spends much of his time speaking to council staff up and down the country. He fears some organisations have not yet fully formulated a clear digital vision, and considered how it connects to broader aims. It was a philosophy strongly espoused by others around the table. For Aidan Rave, a key barrier to digitisation is a tendency to see such efforts as something that should only concern IT departments. A challenge, Ms Hopkins said, was determining just how much money should be poured into those sorts of efforts. And she suggested that if digitisation is to become widespread in local government, councils will need to think about innovative ways in which to fund technological change. “I think there would be a lot more joint venture type capacity that we ought to be building in,” she said. That will be a shift in approach for councils. But it is also likely to mean a change for suppliers of digital technology. Indeed, a major thread of the conversation at the roundtable was what support local authorities will need from technology companies to progress on the digital agenda. The consensus: something quite different from that which has come before. “I think we do need to work far more collaboratively, and listen to some of the great ideas our customers have, and then influence that in terms of some of the investment decisions we make,” added his colleague Chris Singleton. For Siobhan Coughlan – lead on digital, technology and cybersecurity at the LGA – there was no doubt that when it came to working with the private sector “there are some great partnerships and there has been some great work to help us deliver services better, more efficiently”. But she shared concerns that efforts to digitise the local government landscape have often seen subtle variations on a theme, leading to a constant reinvention of the wheel, or alternatively a tendency to get seduced by whatever is perceived as the next big thing. “For me, there sometimes seems to be too much focus on the next thing, like the silver bullet that’s going to solve all our problems, whether that’s blockchain, or whether that’s crypto-currency. “But if we’ve got apps that have already been developed, why are we developing new ones? “If we’ve got systems and processes that already work, why do we have to have 353 slightly different ones. Why don’t we just have the same one and mainstream that better, so that we can benefit from that? But more importantly that enables us to join up across councils. It is notable that at Manchester City Council strong relationships with commercial providers are considered central to digitisation efforts. “I’ve got a team whose specific responsibility every day is about maximising our relationship with partners,” said Bob Brown, the council’s chief information officer. If modern digital technology is to become embedded across a range of local authorities, many of our panellists argued part of the relationship change with suppliers would need to focus on procurement. He said such an approach has the advantage that “you will, by default, avoid ending up with legacy systems – at least for a much longer period of time than you are now”. Certainly widespread presence of old and outdated IT systems was felt to be a barrier by many around the table. “[We have] lots of legacy systems, which in themselves don’t necessarily add up and connect very well,” said Mr Hagg. But the LGA’s Ms Coughlan suggested staff in local authorities did tend to forget the quality of digital service they are already providing to their citizens. So there is more work to be done if digital technology is truly to aid councils in providing the most efficient services to their citizens. But our panel members were in no doubt that it’s a journey which has already begun. This roundtable discussion was sponsored by Capita. The topic was agreed by LGC and Capita. The report was commissioned and edited by LGC. See LGCplus.com/Guidelines for more information. How relevant is technology to the future of local government? And how can councils make sure it’s not for its own sake, but has a direct, positive impact on the communities they serve? I was privileged to hear passionate and visionary local government leaders consider just this at the roundtable event, discussing the opportunities and challenges presented by greater digitisation. We pondered how a digital approach could flourish in local government, not just in the old sense of using IT to speed things up, but in delivering and protecting services for the future, and improving citizens’ experience. We concluded that technology can help in unexpected ways – if you have the vision. One forward-thinking authority has invested in a network allowing devices to communicate wirelessly over a long range, letting bin sensors tell environmental waste teams when they’re nearly full. The idea is that there would be fewer wasted journeys, making teams more efficient, and communities would benefit psychologically and physically from being in a clean, litter-free environment. It doesn’t take someone with IT knowledge to recognise a community or service need. Staff in local authorities across the country will know areas they’d like to improve, from processing benefits applications to licences and trading standards. But it does take someone with technological expertise to recognise there’s a potential solution, rather than accepting things as they are. Much of the roundtable discussion focused on the importance of making a digital approach central to the entire organisation’s aims and vision. We agreed this requires two significant culture shifts, first in recognising that systems are about people rather than being the preserve of the council’s tech teams. We all live and breathe technology every day, and can see developments in artificial intelligence, analytics, automation and voice assistants that enhance how we live. The second culture shift is about no longer considering IT companies as simply suppliers that provide a product to fix a problem. Local authorities need to select an IT company as an IT partner to collaborate with, helping meet their vision and aims for the future. Technology partners can support local authorities with strategies to boost income as more councils focus on increasing revenue to help maintain, protect and improve their services. IT specialists can help teams identify opportunities and devise innovative technology pathways to ensure the council benefits from the increased income, without a knock-on effect on staff resources. One thought-provoking idea from the roundtable was the suggestion of a change in the procurement of IT services to achieve this. This would mean councils seeking a long-term relationship with a trusted IT partner, so they can work together to really think outside the box. This collaboration could then support them to improve the customer experience, help with the efficient delivery of services, and make our communities better places to live in.